kitsch me – halloween goodies!! Wow.. It’s been a while since I blogged. Mainly because I couldn’t figure out how to get into my domains control panel. FRUSTRATING! Anyway, I’ve made some cheap & cute items for the FOR THE LOVE OF… HALLOWEEN sim/hunt. Pics & details below! This necklace comes in two versions… with or without the creepy red eyes. Purchase them exclusively at FTLO… Halloween ! just follow the red beacon to the kitsch me / sars store! Same as the above version, only this one is all black & grey! This photo shows the eye version. This cutesy bat necklace comes in four different versions! Black & silver, all silver, all black and a halloweeny black & orange version. There is a FIFTH version of this necklace in the store as a hunt item so be sure to take the time to look around for that freebie! 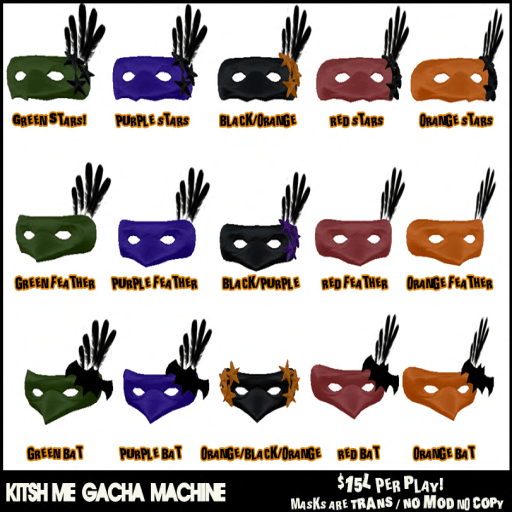 kitsch me - halloween gacha masks! The FTLO Halloween GACHA FEST started a few days ago.. so be sure and go check out what the other designers have put out!! Everything in this post can be found here: FTLO… Halloween ! just follow the red beacon to the kitsch me / sars store!